Here at Time Out, we’re all about doing stuff. We love it. And recently, we’ve been excited by a spate of bar openings where doing stuff – from darts to golf – has been at the heart of the establishment. Few, however, have combined drinking with something as innovative as this new Shek Tong Tsui bar. 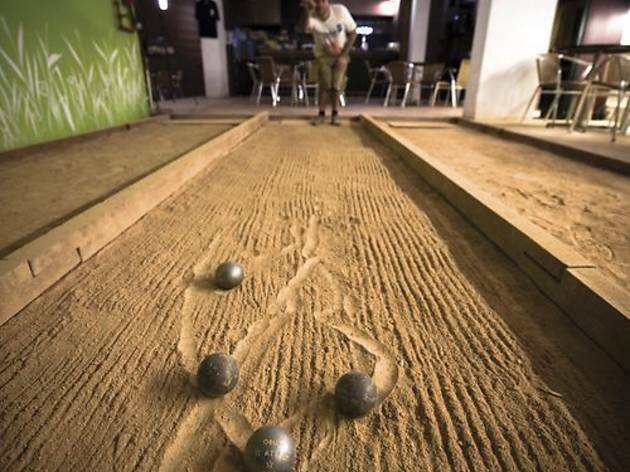 Located on a small, inclined street in Western District is Les Boules – Café Petanque, a subterranean spot that claims to be the world’s first indoor petanque bar. While it’s difficult to verify those claims, it’s safe to say that Hong Kong has never seen anything quite like it. After descending an intriguing staircase, Les Boules opens out into a surprisingly cavernous basement, featuring high ceilings and bright wooden furnishings. Wrapping around the staircase is a sunken tier, dotted with café-style cane chairs and tables, as well as a cushion-lined wall-hugging couch. And from there, the space extends to the bar with a touch of greenery and, for your petanque-playing pleasure, three narrow, sand-topped lanes specifically designed for the French ball game. So what’s this sport all about? Well, petanque is not dissimilar to lawn bowls or the Italian bocce. The aim of the game is to throw your weighty metallic boules closer to a smaller ball (the jack) than your opponent. And that’s about it – simple in theory, difficult in practice. Shell out $40 to hire your boules, grab a lane ($40/hour) and start refining your petanque skills. 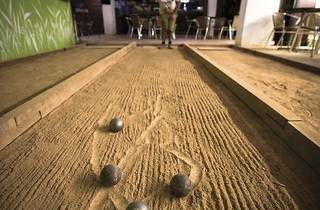 Beyond its gaming novelty, the great strength of Les Boules is the balance it strikes between bar and petanque. As the name suggests, there’s a certain Gallic ambiance about the space, and being part-owned by the crew behind Gecko Absinthe Lounge, it seeps that rustic, relaxed charm, albeit in a slightly dustier and rough-around-the-edges way than its reptilian sister bar in Central. There’s a continuous selection of musique Française, rotating through dramatic parlour music to uber-hip electro pop, and for the non-petanque participants, just like Gecko, boardgames are on offer, from backgammon to Monopoly and chess. There’s also a projector setup, ready to screen classic cinema. While the booze selection isn’t what you’ll find in a hotel bar or on Wyndham Street, there’s a nice theme to the drinks on offer. Kronenbourg ($50) is one of the four draft beers on offer; Beaujolais Nouveau and rosé from L’Estandon (both $70) are at the top end of the limited but distinctly French wine list; and Ricard ($40) and Absente ($50) head up the spiritual end of the bar. We also hear that there are plans for tapas (Frapas?) in the near future. While French restaurants have been abundant in our city, the drinking end has not been so profuse. With its unmistakable focus, Les Boules – Café Petanque could well become a haven for those craving an alternative taste of Paris. Or just a bit of petanque. 18 Woo Hop St, Shek Tong Tsui, 2872 0102, www.lesboules.hk.